Because there are so many excellent historical and pictorial sources on the Internet for all of the I will not dwell on them her. Historia dos Acores is just one. Our forebears, as we have said, were hard workers. 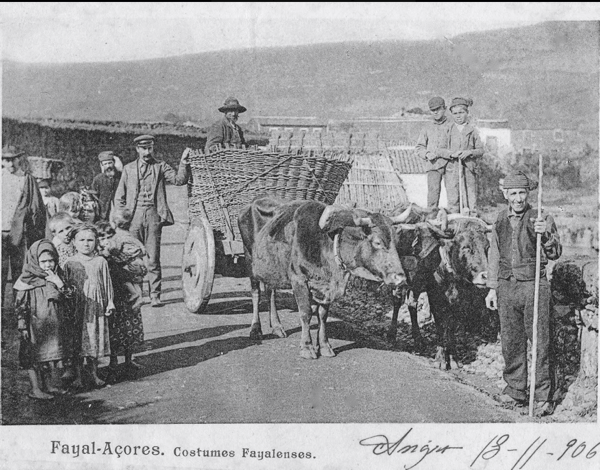 The above photograph from the site mentioned is an example of what Azorean and Madeira life was like for many of them in the early 1900's. Preparing to come to America was a dream for something better, something more. The labor situations that immigrants found when they came to this country is a fascinating, albeit troubling, part of the nation's history. This was brought home to me as I worked on my maternal grandparent's story and because of that I feel it is important to talk about it here. It gives us new respect for the work ethics of our elders who paved the way for us, a way much easier than theirs. Though many of them worked as entrepreneurs in the Village, they often had to supplement income by working elsewhere. They brought their industriousness to their new lives. For many of them, life would continue to be difficult, but with more reward. Arlene Gouveia's father-in-law came to the Village and purchased a large piece of land on upper School St. He grew crops including purple and white grape vines, fruit trees, and raised goats and a few pigs. A lot of folks who raised pigs called him when it was time. A vegetarian now, I prefer not to remember that... He was from Madeira, part of a goodly amount of Madeira folk who settled in the Village. Many of the Azoreans were factory or mill workers, that would have included my maternal grandparents Isobel and Manuel Motta. She was employed at a shoe leather dying factory in Bristol, R.I., the Old Columbia Mill in East Taunton, The Berry Rag Shop. The latter was located at the bottom of Arlington St. in the Village and she worked there with her mother Anna (I notice this building still is located at the same place as it was when I was a child gazing at all those bales and bales of colorful rags)., She also worked at the Cohen Mills in Taunton as a cotton threader winder, and finally at the Plymouth Cordage Co. in Plymouth which manufactured rope. ( Note: Plymouth Cordage Co. has a fascinating history if you are interested and a museum in Plymouth,MA). 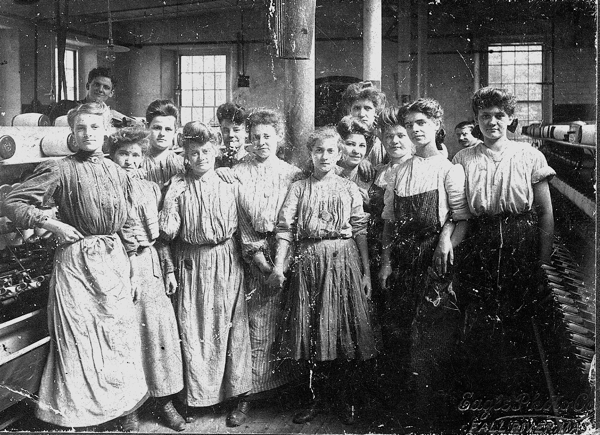 Most of the manufacturing work took place within a bubbling stew of toxic conditions that often took a toll of the health of many of the workers. My maternal grandfather, Manuel Motta, worked for Glenwood Range in Taunton. He was employed as a stove worker. At that time Glenwood used quartz dust and the ventilation was very poor. My grandfather contracted silicosis (Black Lung) which led to tuberculosis. Another worker from the Village also contracted the condition. It would be fatal for my grandfather at a young age. The Glenwood situation prompted Massachusetts to form the Division of Occupational Labor and Workforce Development. One of the first in the nation. The picture below is a very precious photograph. not only did she work in the mills, she also went on to bear 14 living children. produced lanolin. In the late 1800's there was the Whittenton Cotton Textile factory, which once boasted 1,600 looms. The Whittenton buildings still stand and are on the National Historic Register. You may recall that the suspense movie, Shutter Island, was filmed there not long ago. Coming here was chasing a dream, it also had its costs. Next: last post in the Origins series: the composition of the Village population, then and now.